Udaipur: Radio City, India’s leading radio network, today announced the launch of Gig City Season 3, India’s biggest live multicity simulcast concert on radio,all set to entertain 6.7 Cr Indians withrivetingperformances from the best of the music industry includingSachin - Jigar,Sukhwinder Singh, Neeti Mohan. Armaan Malik, Monali Thakur. Gig City’s concept of AapJahaan, Concert Wahan has given a new dimension to the idea of a concert and has utilized radio as a medium for listenersto experience a live concert by their favorite music artistson the go. The first gig of Radio City’s Gig City Season 3 featuring Sachin- Jigar is all set to kick-start on Friday, 15th June at 7:00PM onwards and repeat on Saturday 9PM onwards. Gig City Season 3 will be hosted by Radio City’s most popular RJ Salil who take the listeners on a nostalgic trip mingled with interesting trivia about their favorite artists. Commenting on the launch of the latest season of this innovative property,Mr. 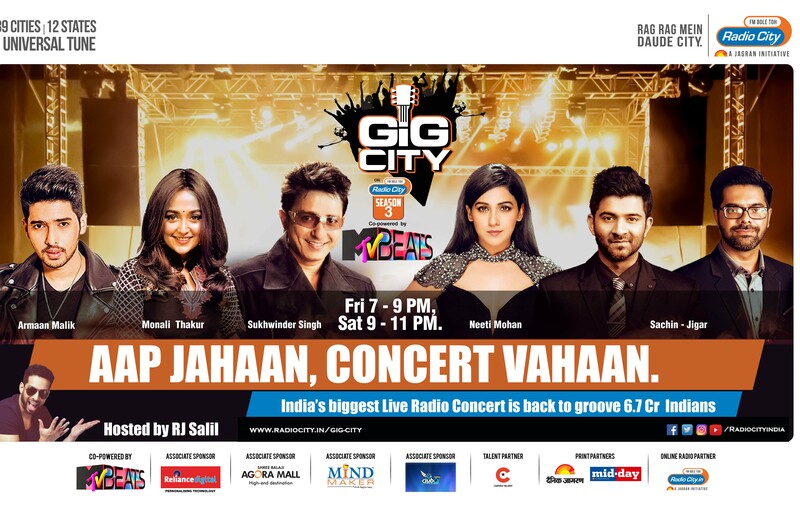 Abraham Thomas, CEO, Radio Citysaid“Radio City’s Gig City has constantly grown in stature due to its innovative proposition of AapJahan concert wahan and has seen massive success amongst the fraternity and music lovers nationally. The uniqueness of the concept and the stupendous responseamongst advertisers has helped us extend the property on ground in multiple cities since the last two years.With the launch of Gig City Season 3, we are all set to give our listeners a bouquet of innovative and engaging content on air, online and on ground. Excited for his performance at the latest season of Gig City Season 3, talented Bollywood singer and hit-maker Armaan Malik said,“Singing for a LIVE audience has always been a special experience for me to stay connected to my fans. Concerts bring families and friends together and are a perfect avenue for music lovers to enjoy the performances of their favourite singers. I would like to congratulate Radio City for bringing alive India’s first radio concert- Gig City Season 3, to us. I am super excited for my LIVE concert through radio and connect with my fans on the go. Call out to all music lovers to tune in every Friday 7pm for an evening full of music and entertainment” The concerts will air every Friday 7:00PM to 9:00PMand a repeat broadcast on Saturday 9:00 PM to 11:00 PMacross 25 Hindi Speaking markets.